This is a great design by Mastercraft, crafted in brass and with corner details reminiscent of the Chinese Ming style. The pair of end or side tables show their age beautifully with good patina to the brass. Natural oxidation to brass consistent with age. Of impeccable craftsmanship, sturdy construction and Minimalist design these tables gain a subtle feel and color from the first grade and well executed leather covering. Vintage Asian Mastercraft Greek key side table in brass and glass. 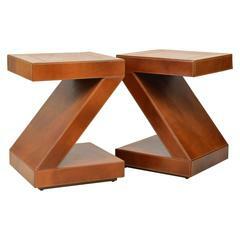 Vintage pair of octagonal brass Mastercraft end side beverage tables. These have been professionally polished and have beautiful antique mirror places in them. Absolutely gorgeous!